Add a flux capacitor and a Mr. Fusion to a DeLorean and it becomes a time machine. But without those, a DeLorean is just a car. A 35-year old car at that, and thus lacking even the most basic modern amenities. No GPS, no Bluetooth — not even remote locks for the gullwing doors! To fix that, [TheKingofDub] decided to deck his DeLorean out with an iPad dash computer that upgrades the cockpit experience, and we have to say we’re impressed by the results. Luckily, the space occupied by the original stereo and dash vents in the center console is the perfect size for an iPad mini, even with the Lightning cable and audio extension cable attached. A Bluetooth relay module is used to interface to the doors, windows, trunk, garage door remote, and outdoor temperature sensor. A WiFi backup camera frames the rear license plate. Custom software ties everything together with OEM-looking icons and a big GPS speedometer. The build looks great, adds functionality, and should make road trips a little easier. When [TheKingofDub] finally gets sick of people complaining about where the BTTF guts are, maybe he can add a flux capacitor and time circuits. We love our props here at Hackaday, and whenever we come across a piece from the Back To The Future fandom, it’s hard to resist showcasing it. In this case, [Xyster101] is showing of his build of Doc Brown’s Flux Capacitor. [Xyster101] opted for a plywood case — much more economical than the $125 it would have cost him for a proper electrical box. Inside, there’s some clever workarounds to make this look as close as possible to the original. Acrylic rods and spheres were shaped and glued together to replicate the trinity of glass tubes, 3/4″ plywood cut by a hole saw mimicked the solenoids, steel rods were sanded down for the trio of points in the centre of the device and the spark plug wires and banana connectors aren’t functional, but complete the look. Including paint, soldering and copious use of hot glue to hold everything in place, the build phase took about thirty hours. The LEDs have multiple modes, controlled by DIP switches hidden under a pipe on the side of the box. There’s also motion sensor on the bottom of the case that triggers the LEDs to flicker when you walk by. And, if you want to take your time-travel to-go, there’s a nine volt plug to let you show it off wherever — or whenever — you’re traveling to. Check out the build video after the break. Here’s a blast from the past, or future, reminiscent of the self-lacing shoes from Back to the Future Part II. [Vimal Patel] made his own self-lacing shoe using LEGO “bolted” to the shoe’s sole. We think these are cooler than the movie version since we get to see the mechanism in action, urging it on as the motor gets loaded down pulling the laces for that last little bit of tightness. The electronics are all LEGO’s Power Functions parts. A Dremel was used to make holes in the soles to hot glue LEGO pieces for four attachment points. The attachment points are permanent but the rest can be easily removed. In case you want to look them up or make your own, he’s using the using the 8878 rechargeable LiPo battery box, the 88003 L-motor, the 8884 IR receiver, and the 8885 IR remote control. That’s right, these shoes are laced up under command of an IR remote control, well, provided the battery box is powered on. There’s a 1:24 worm gear reduction to get the needed torque. This was a quick build for [Patel], done over two afternoons. He initially tried with the winding axle behind the heel but that didn’t work well so he moved the axle adjacent to the laces instead, which works great as you can see in the video after the break. While real time-travel is obviously not happening anytime soon, with this Back to the Future themed alarm clock, you can go to the future in seven hour eight hour increments by going to sleep. Great Scott! [CrossleyAcoustics] spent the past few months designing and building this movie-prop worthy alarm clock, and it certainly shows. After designing everything on breadboards, he had custom PCBs made, he modeled the whole thing in Sketchup (first time he’s used it!) and even tried his hand at the sheet metal fabrication after shops quoted him thousands for what he wanted. The coolest part of the build is that [CrossleyAcoustics] had some detailed drawings that he had made himself… when he was 8 years old. Talk about a plan coming together! Sometime this evening, after we haven’t rehydrated a pizza for dinner, all of the events portrayed in Back To The Future will have happened in the past. This is it. This is the day all your dreams die. So, what’s so special about the technology in Back To The Future that we don’t have now? Hoverboards, obviously, but a lot of people have been doing their part to make sure we have something like a hoverboard on this important day. Last week, the record for the longest hoverboard flight was broken by a Canadian company making large multirotor platforms. While it’s called a hoverboard, it’s really not in the spirit of the device that would recreate the skateboard chase scene in front of Hill Valley’s courthouse. For that, you’ll need something that doesn’t use propellers, at least. There’s a better way to construct a hoverboard than by strapping a few blenders to your feet. Last summer, Lexus built one with superconducting materials and magnets. Yes, it’s effectively the same demonstration you’ve always seen with superconducting materials, only this time it’s dressed up with pro skaters. There are tens of thousands of dollars worth of magnets in the Lexus hoverboard, making this entirely impractical for anyone who wants to build their own. There is another option if you want a hoverboard. This day, last year, Hendo Hoverboards launched a Kickstarter with the best media blitz we’ve ever seen. They built a hoverboard that is basically a quadcopter, but instead of propellers, they use magnets. These magnets produce eddy currents in the metallic, non-ferrous ‘hover surface’. The grand prize for this Kickstarter? Today, October 21, 2015, you’ll be invited to a VIP event where you will not only get to ride a hoverboard, you’ll get one to take home. Price: $10,000. News drones. People still read newspapers. This company isn’t in the market of building hoverboards; they have a much, much more grandiose idea: the founder wants to use hoverboards as a stepping stone to an active earthquake mitigation strategy for buildings. Yes, buildings can hover inches above their foundation, just in case an earthquake strikes. You say the power might go out during an earthquake, causing the building to fall inches to the ground? I never said it was a good idea. Lucky for us, the Hendo hoverboard did prove to be a proof of concept that a ‘spinning magnet’ hoverboard is capable of supporting the weight of a rider. We know a few people have been working on this technology before the Hendo hoverboard was announced, and replicating the Hendo hoverboard build shouldn’t cost more than about $1000 USD. We’re eventually going to have to do this, and we’re going to replicate the Pitbull hoverboard, bojo, because we want powah. So, what else of Back to the Future Part II hasn’t become a reality? News drones. People don’t read newspapers anymore. Self-driving cars are more realistic than hovercar conversions. Pepsi Perfect exists, but only at a Comic Con. Nike Air Mags exist, but not with power laces. The world of Hill Valley still has fax machines, and I really want to rehydrate a pizza. It’s alright, most of the technology of Back to the Future was just a joke; ‘Queen Diana’ would have never happened, and what exactly was the point of Gray’s Sports Almanac if you can look everything up on the Internet? 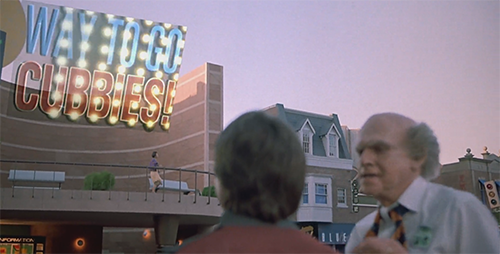 There was one possibly accurate prediction in Back to the Future: The Chicago Cubs may win the 2015 World Series. Let me repeat that, for effect. The most accurate prediction of the future given to us in Back to the Future was that the Chicago Cubs win the World Series. That’s how inaccurate Back To The Future was. Quick Marty! We Have To Go Back, With the Golf Cart! Talk about an awesome project. [Lucas Evanochko] was commissioned to build this totally rad Delorean style golf Cart for Red Deer College’s 30th annual Golf Tournament. According to him, it’s been about 600 hours in the making – and they only started building it in July. This past week was its big unveiling, and it has had an overwhelmingly positive response so far! They started with one of the club’s golf carts and modified it heavily, relying on the automotive expertise of [David Keykants] and [John Perrin] to turn it into the aw-worthy time machine it is today. It has a 7” tablet built right into the dash to play music and use the Fluxy88 Time Circuits app. A big array of arcade buttons hooked up to an Adafruit Audio FX board play various sound bites from the movie, including the theme music! All the accessories are powered off of a separate 12V system from the main 48V drive line. Oh and the Flux Capacitor? It’s controlled by a Trinket Pro. Check it out after the break. We love the detail that went into this! If you are into your social media, then you probably like to stay updated with your notifications. [Gamaral] feels this way but he wasn’t happy with the standard way of checking the website or waiting for his phone to alert him. He wanted something a little more flashy. Something like a flux capacitor notification light. This device won’t send his messages back in time, but it does look cool. He started with an off-the-shelf flux capacitor USB charger. Normally this device just looks cool when charging your USB devices. [Gamaral] wanted to give himself more control of it. He started by opening up the case and replacing a single surface mount resistor. The replacement component is actually a 3.3V regulator that happens to be a similar form factor as the original resistor. This regulator can now provide steady power to the device itself, as well as a ESP8266 module. The ESP8266 module has built-in WiFi capabilities for a low price. The board itself is also quite small, making it suitable for this project. [Gamaral] used just two GPIO pins. The first one toggles the flux circuit on and off, and the second keeps track of the current state of the circuit. To actually trigger the change, [gamaral] just connects to the module via TCP and issues a “TIME CIRCUIT ON/OFF” command. The simplicity makes the unit more versatile because an application running on a PC can actually track various social media and flash the unit accordingly.